IABC Chicago proudly presented Susan D’Alexander, ABC with the 2018 Karen Utterback Volunteer Award – which recognizes a veteran IABC Chicago member who exemplifies communications excellence and stewardship – at this year’s Bronze Quill Awards reception. Karen Utterback Volunteer Award recipients demonstrate unyielding dedication to the betterment of communications excellence, serve as mentors to professionals and embody the essence of IABC Chicago. Established in 2012, the award is named in memory of IABC Chicago chapter president, Karen Utterback, ABC. Susan has been a long-time member of IABC, engaging in volunteer roles with IABC Chicago and IABC international. As Accreditation Director, Susan was part of the team that pioneered the training program for accreditation here in Chicago. She was instrumental in elevating and promoting accreditation. She has also served as Volunteer Director and helped with the Bronze Quill Awards planning for IABC Chicago. For IABC she has been a long-time Quill Awards evaluator and chaired the Virtual Blue Ribbon Panel for the Gold Quill Awards. “Susan embraces the heart and spirit of IABC Chicago in that she’s willing to pitch in whenever asked and does so with heart. Susan is a great ambassador of IABC Chicago, commented past recipient Gabrielle Loring on bestowing the award to Susan. When asked about what stands out to Susan about her IABC membership, she commented, “It is IABC’s diversity of professions, types of businesses and members sharing their experiences and expertise – all opportunities to learn from each other. In other words, it’s the people! IABC’s professional development programs helped me achieve an Accredited Business Communicator (ABC) certification and several Gold Quills during my career. 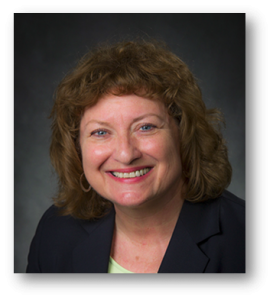 “Susan is the whole package: she’s an experienced communicator who finds a way to give back to her profession every year – as a chapter leader, awards judge, student mentor and role model for other communicators,” said another past Karen Utterback Award recipient, Susan Heitsch.